The so-called "wine in a can specialists" at Friends Fun Wine have introduced the world's first coffee wines. Thanks? Of the two new varieties, Cabernet Coffee Espresso features a rich flavour of cabernet grapes, espresso coffee and a hint of chocolate, while Chardonnay Coffee Cappuccino features sweet Chardonnay grapes with vanilla cappuccino coffee and smooth hints of chocolate. Chardonnay. Coffee. Cappuccino. I can't even begin to imagine how that combination of flavors could be appealing. It's always worth remembering that sometimes you're the first to do something because everyone else already tried and realized that it sucked. 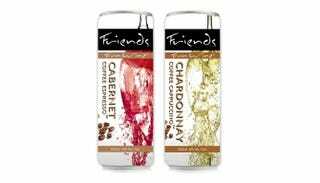 Friends Fun Wine, which already carries a variety of flavored sangrias and moscatos, sees their new coffee products as a marriage between "the world's most popular Day Drink with the world's most popular Night Drink." It's not clear if there is actual coffee in the wines or if they're just coffee flavored, but I don't really think it matters. Like all of Friends Fun Wine's products, their new coffee wines are low-calorie and have an alcohol content of only 6%. I would like to speak to the focus group that tested coffee wine and apparently gave it a thumbs-up. They have done us all a disservice and should be held accountable for their actions.